A contentious grilling of Acting U.S. Attorney General Matthew Whitaker on Friday in Washington, D.C. included many topics of broad national interest. One of those topics — basically, the question of who employed Whitaker from 2014-’17 — detoured into the narrower world of legal U.S. sports betting expansion, and to the possible involvement of Las Vegas casino billionaire Sheldon Adelson in a recent reinterpretation of The Wire Act by the Department of Justice. 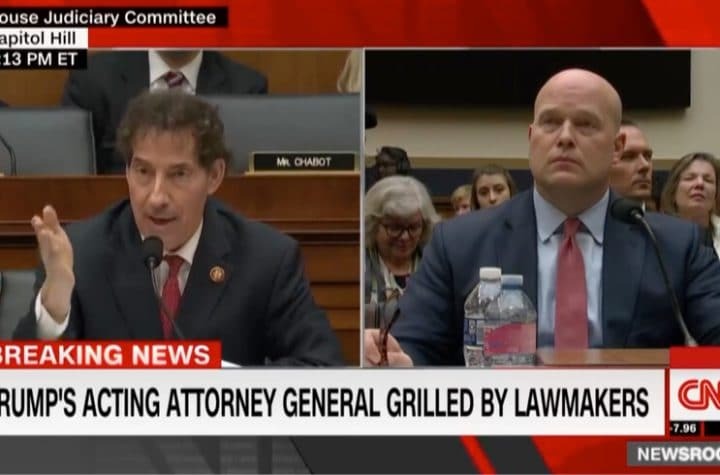 U.S. Rep. Jamie Raskin, D-Maryland, noted that Whitaker, while serving as executive director of the Foundation for Accountability and Civic Trust (FACT), was the sole employee. “Do you know who the donor was — the group that funded your salary?” Raskin asked. Raskin noted that group was merely a “pass-through” company, so he asked again who funded his salary. “I have no idea,” Whitaker replied. Raskin used that exchange with Whitaker as a launching point. “I’ve got a theory I want to float with you,” Raskin said. “It goes to something strange that has been happening at the Department of Justice recently. “Casino billionaire Sheldon Adelson hates online gambling for obvious reasons. That’s competition for him. He wants people [gambling] in the casino, not online. “[Adelson] spent more than a million dollars lobbying Congress to override a  opinion by the Office of Legal Counsel — the Department of Justice — saying that The Wire Act only prohibits sports gambling online, not gambling in-state. “But Congress wouldn’t change the law according to the demands of Mr. Adelson. So rather than change the law, he decided to try to get the Department of Justice to change the interpretation of the law. And he threw millions into a campaign to remake the DOJ and get the Office of Legal Counsel to perform a complete reversal and say that The Wire Act bans the kind of lotteries that states have online, even though the language plainly only prohibits sports betting. Raskin then asked Whitaker if he was “involved in that decision” to revisit The Wire Act. Whitaker replied that since Sessions recused himself, Whitaker also was recused — so no. “Mr. Chairman, your inference that somehow that process was corrupted is absolutely wrong — and the premise of your question, I reject,” Whitaker replied. Whitaker added that he has never met Adelson and did not meet with his lobbyists on the matter. But he said he does know Charles Cooper. And who is Cooper? Let’s backtrack a little. When Sessions testified before the Senate at his confirmation hearing in Jan. 2017, Sen. Lindsey Graham, R-South Carolina, surprised many by using a portion of his limited time to ask Sessions about that 2011 interpretation of The Wire Act. Sessions promised to “revisit” the issue if confirmed (he was). But a number of events followed that seemingly would ultimately benefit legal gambling expansion backers. The law firm of Cooper — a close friend of Sessions, by many accounts — drafted a legal memo in April 2017 making the case that DOJ erred in its limited conclusions in the 2011 memo. Cooper, meanwhile, is a former lobbyist for Adelson’s Coalition to Stop Internet Gambling. In June 2017, Sessions hired Cooper to represent him regarding investigations into potential Russian meddling into the 2016 election. With Cooper now even more closely aligned with Sessions as well as with an anti-gambling stance, Sessions announced he would stay away from issues related to such topics. That seemed to put the debate on ice for the duration of Sessions’ term, which ended with his resignation in Nov. 2018 after a series of unrelated clashes with Trump. The temporary replacement was Whitaker, but in just four weeks Trump had come up with a more permanent candidate, renowned attorney William Barr. Of course, now Adelson seemed to be in a pickle. While Barr in January had expressed his support for a federal marijuana ban, he added that he was “not going to go after companies” that were relying on a 2013 Attorney General’s office memo that called for a de-prioritizing of enforcement of marijuana prohibitions. In other words, Barr was taking a textbook conservative stance: a preference for limited government overall, with a nod to state’s rights to make their own decisions on such issues. And the 2011 Wire Act interpretation seemed to be a nearly-identical parallel. Facing a window of probably just a few months to go after that interpretation, Adelson had to have been pleased to hear of the DOJ announcement, on literally the eve of Barr’s testimony, that it issued an undoing of that interpretation. The 23-page memo left gambling supporters and opponents alike, not to mention the media, confused about the magnitude of the revision. Multi-state online poker compacts certainly seem vulnerable, while it would be a surprise if in-state lotteries were. But all things are possible in this confusing new era. Now, as Barr’s confirmation looms — Republicans have control of the Senate, which will vote on his nomination — the next question will be what, if any, weight the memo has on Barr’s thinking. The source of Whitaker’s $1.2 million in compensation over a span of four years isn’t the only thing that the acting AG could not explain. Raskin also asked about a pair of $2,600 campaign contributions — the maximum allowable amount from an individual — donated by the chairman and executive chairman of Wild Rose Casino and Resorts in Iowa. Asked if he had spoken with the men before receiving the donations, Whitaker said he had not. And no time remained for Raskin to ask a followup.